This quotation is the third part of a series dedicated to the work of the great Edwardian writer Arnold Bennett (1867-1931), on whom we will be co-hosting a symposium (‘Arnold Bennett and His Circle’) at Keele University on 17th-18th October. More details here. 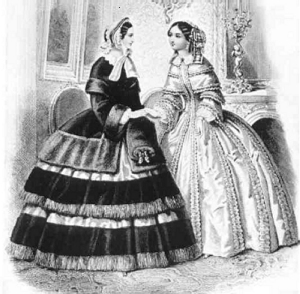 This entry was posted in Quotations and tagged hoop skirts, In the words of Arnold Bennett, victorian fashion. Bookmark the permalink.